A gypsy struggles to leave his criminal father's clutches. When news landed that Michael Fassbender and Brendan Gleeson had been cast in a British drama set among the travelling community, most of us assumed the pair would play Irish travellers. It was odd then, when the first trailer arrived, to hear them - along with fellow Irish actors Killian Scott and Barry Keoghan - speaking in broad, and not entirely convincing, English West Country accents. It's unclear whether the travellers of director Adam Smith's Trespass Against Us have Irish ancestry, but with a surname like Cutler, it's unlikely. That's emblematic of a film that's confused and muddled in many aspects, one that can't seem to make its mind up whether it wants us to view its protagonist as a hero or villain. Fassbender is Chad Cutler, eldest son of Gleeson's gypsy king Colby, leader of a community whose caravans are pitched on a piece of rural land in Gloucestershire, ideally situated for raiding nearby stately homes. Egged on by his long-suffering wife, Kelly (Lyndsey Marshal), Chad is determined to get his family out from under the clutches of his father, secretly conspiring to move into a settled community. But when a raid on the home of a Lord-Lieutenant attracts extra heat from the police, Chad's plans are put in considerable jeopardy. The committed performances of the central trio of Fassbender, Gleeson and Marshal go a long way to keeping the film's head above water, even if the former's accent wobbles on more than a few occasions. Yet while Fassbender and Marshal convincingly sell the stress their characters are under, Gleeson's Colby simply doesn't convince as the intimidating figure we're led to believe he is. It's no fault of Gleeson, it's just that the film tells us we should be afraid of him, but it never backs this up with any evidence. We're given no demonstrations of Colby wielding his influence. To the contrary, he comes off as something of a teddy bear, a big softy. Truth be told, Colby is arguably more likeable than his son, who engages in some pretty awful behaviour (animal lovers will struggle to feel any sympathy for him) and is a bad parent and terrible husband by any measure. There are several points where he crosses the line from anti-hero to antagonist, but the movie gives him a coda he ultimately doesn't deserve. The most interesting character here is Marshal's Kelly, a woman trapped among men who refuse to grow up, and I kept wishing we could spend more time with her and see the narrative from her perspective. While the bulk of Trespass Against Us is a conventional slice of British social realism, it occasionally enters genre territory, with a couple of adrenalin pumping car chases assembled with a level of skill that suggests Smith may be more comfortable in the world of action cinema than character study. These sequences play like they belong in a different movie, and with the film's highlight an extended night time chase, it's probably a better movie than Trespass Against Us. 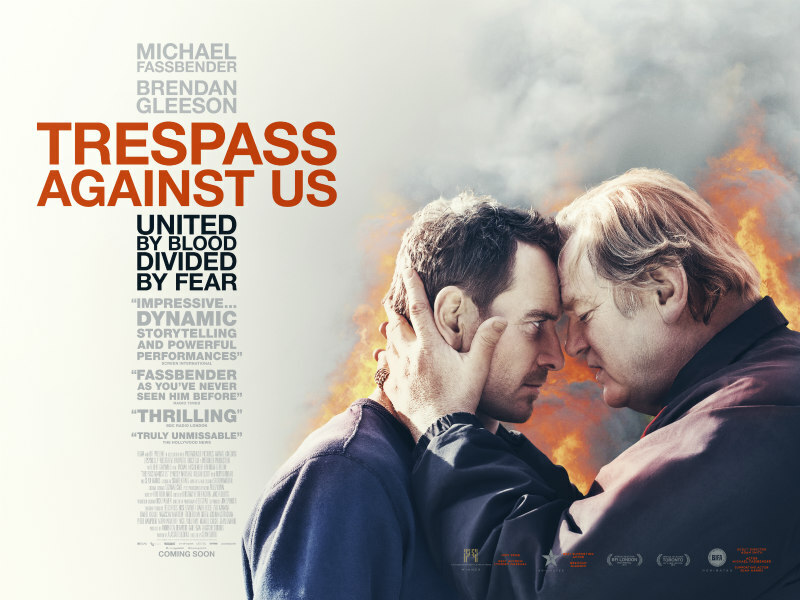 Trespass Against Us is in UK/ROI cinemas March 3rd.